Individuals working in the soft engineering like database, software, development, quality assurance more often needs to deploy & configure different things which need to have an Operating System obviously and sometimes more. 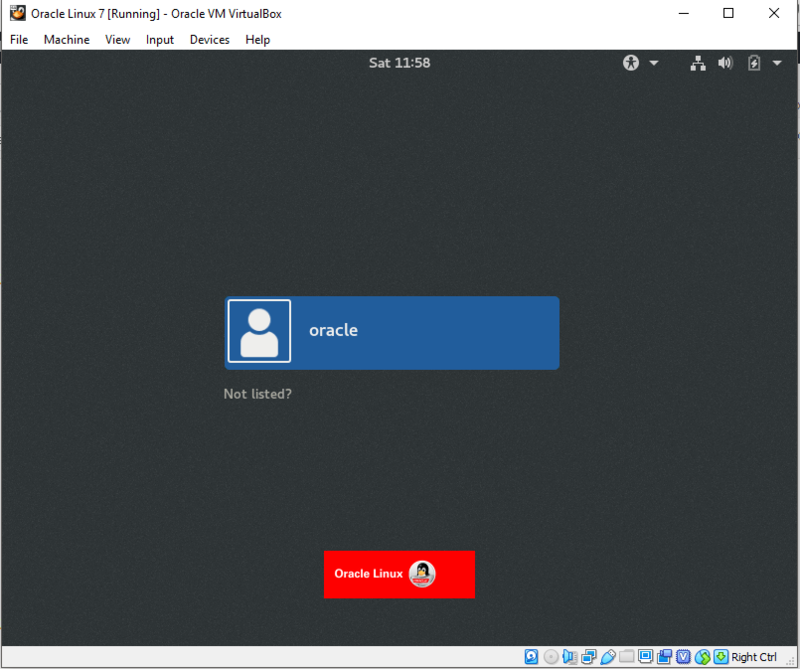 With the advent, maturity and easy to get virtual technologies like VirtualBox, Vmware and Parallels Desktop and others it is easier to install and configure a guest OS on your laptop or desktop on top of the same host OS you are using rather than a dual booting. 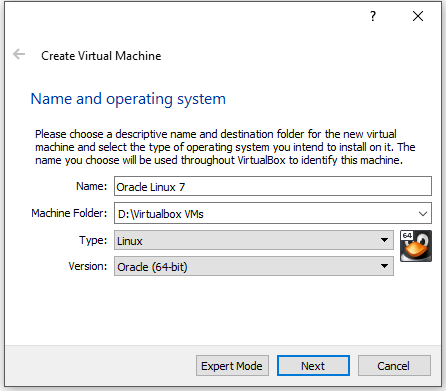 The beauty of VirtualBox is its free and can be used in so many platforms like Windows, OSx, Linux and Unix. 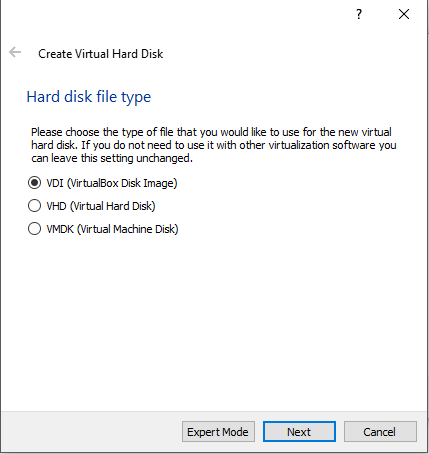 In this case VirtualBox is installed on Windows 10 Enterprise. 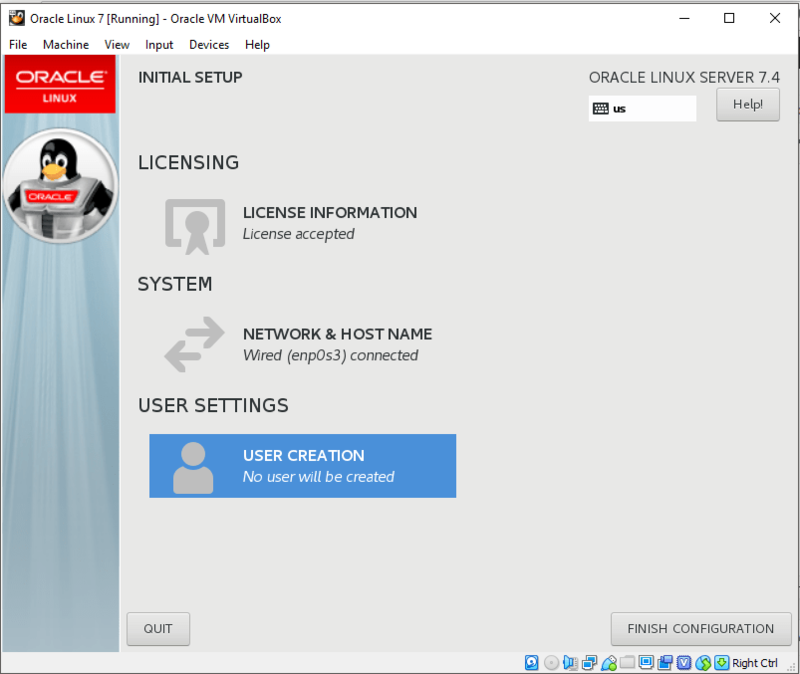 The guest operating system Oracle Linux is based on the Red Hat Linux and is used mainly for oracle technologies. 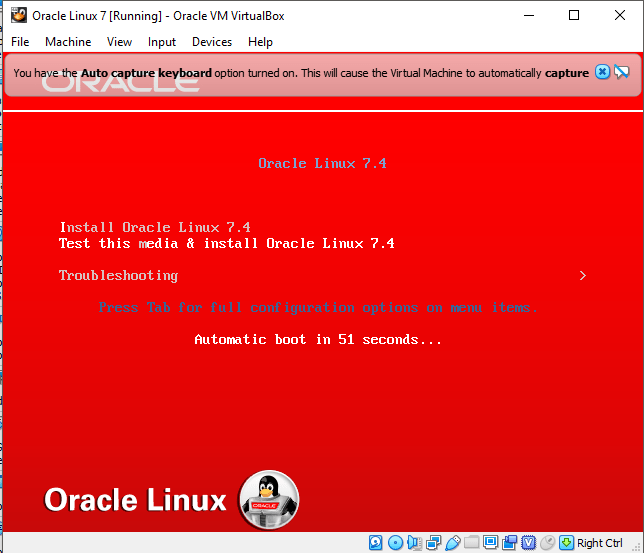 First you need to download an install the VirtualBox from their site. 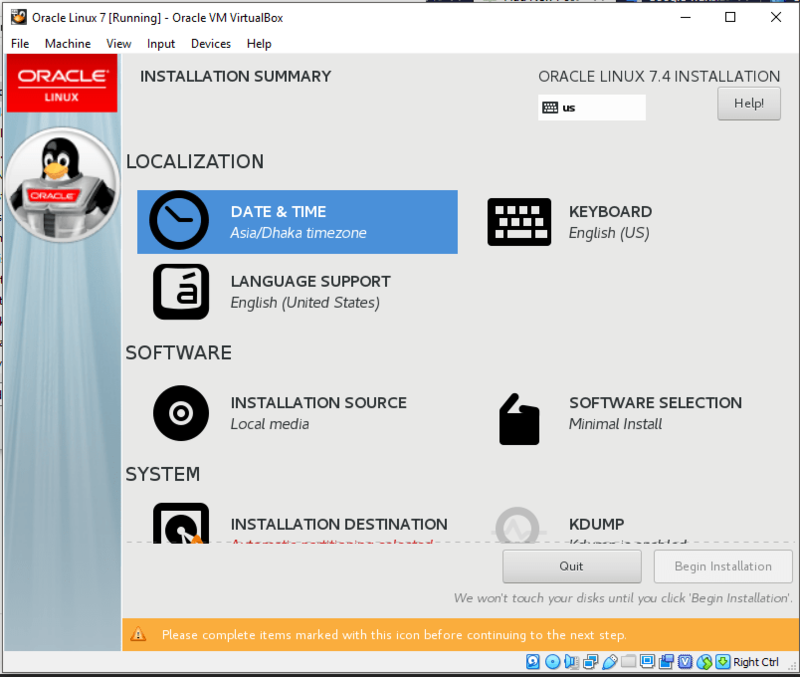 You should have the Oracle Linux 7 distro downloaded in to your laptop or desktop. 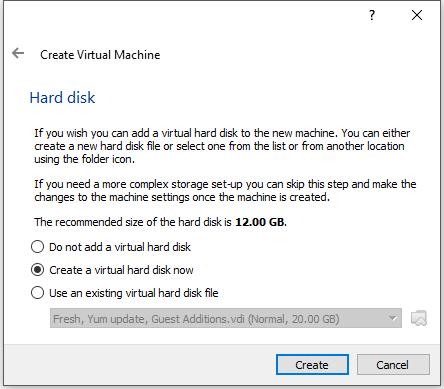 Click New to create a new virtual machine. Supply the Name: Your machine name, Machine Folder: Where to install(folder/directory), Type: The type of operating system(Linux), Version: Which cpu version 32 or 64 bit. 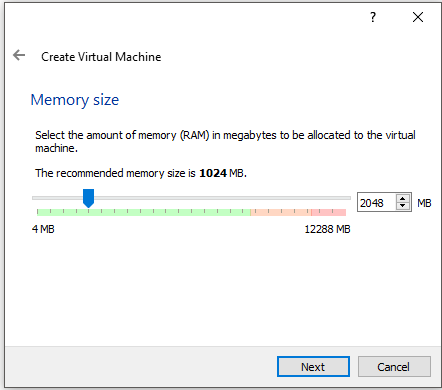 Select the size of memory(RAM) you need for your virtual machine. In this case 2GB. 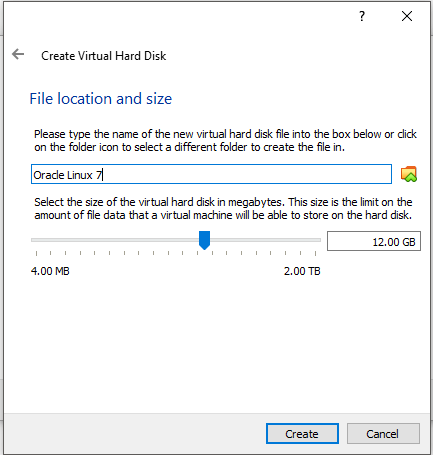 Add a Hard Disk to the virtual machine. 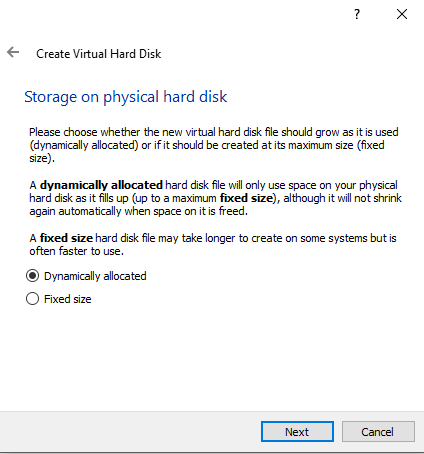 Choose the default “Create a virtual hard disk now”. Choose file location and size. Leave the default or set according to your need. 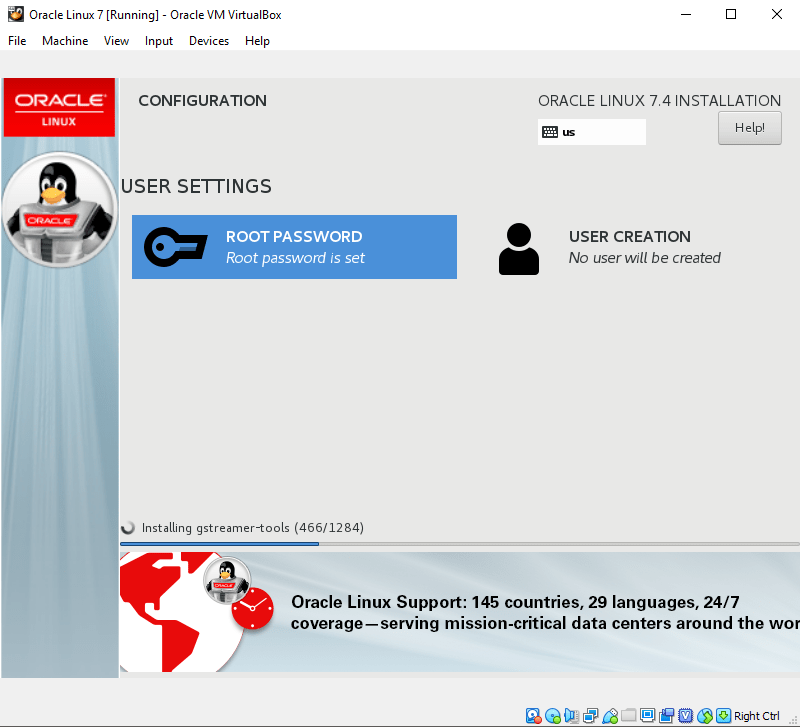 Your newly created VM will be on the list. Right click on the VM and select “Settings”. Choose Pointing Device to “USB Tablet”. Under the “Attributes” > “Optical Drive”. 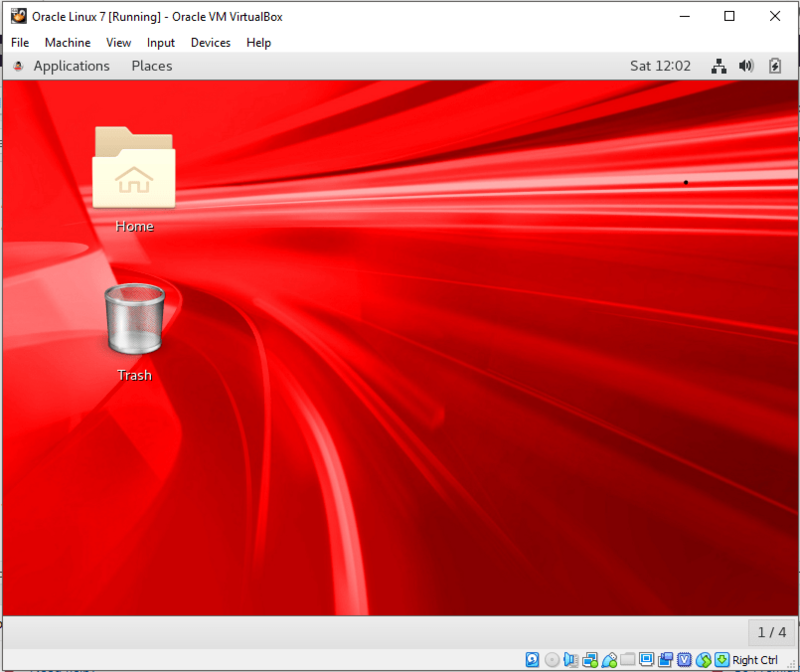 Select “Choose Virtual Optical Disk File” and choose the downloaded .ISO image of the Oracle Linux 7. This will enable internet in your guest operating system. 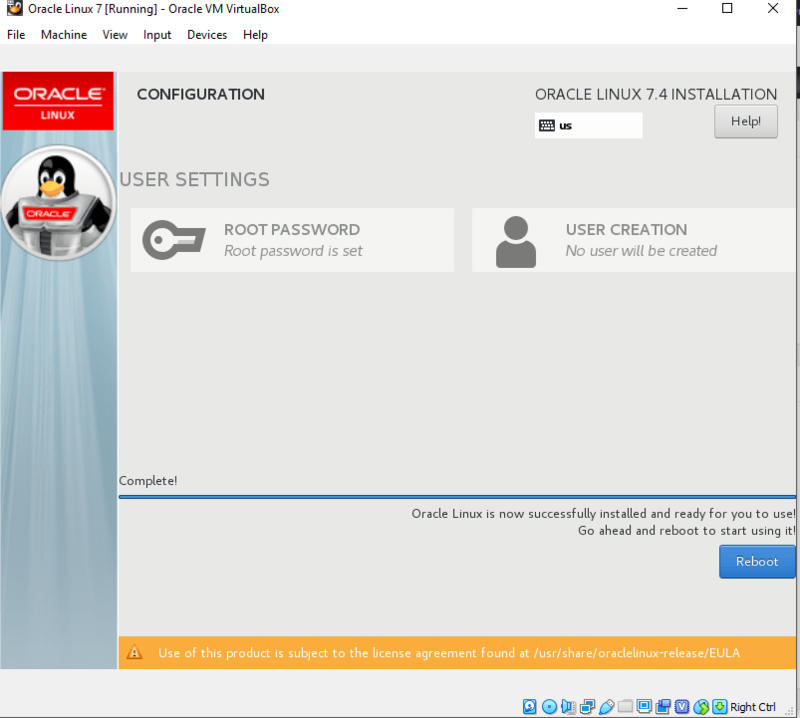 This will start your VM and the installation process of the Oracle Linux. 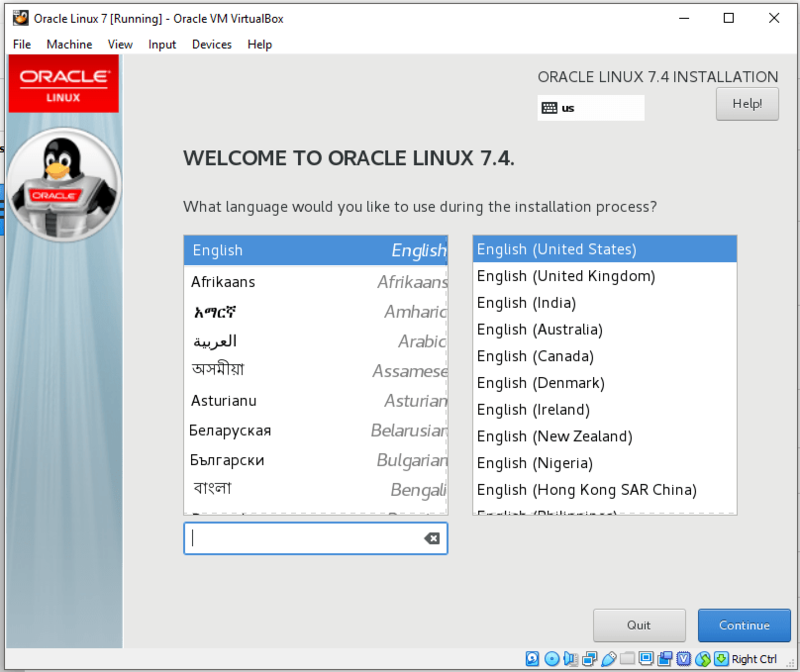 Choose Language to continue with installation process. Under the LOCALIZATION click DATE & TIME. Choose the software or applications to be installed. 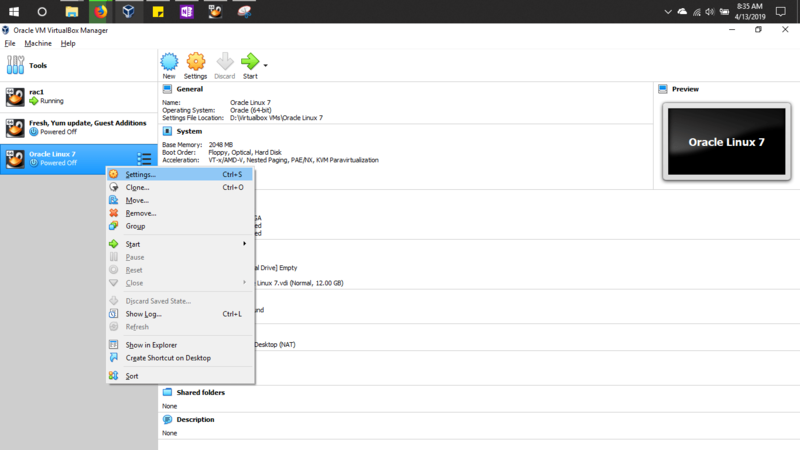 Under SOFTWARE click SOFTWARE SELECTION. 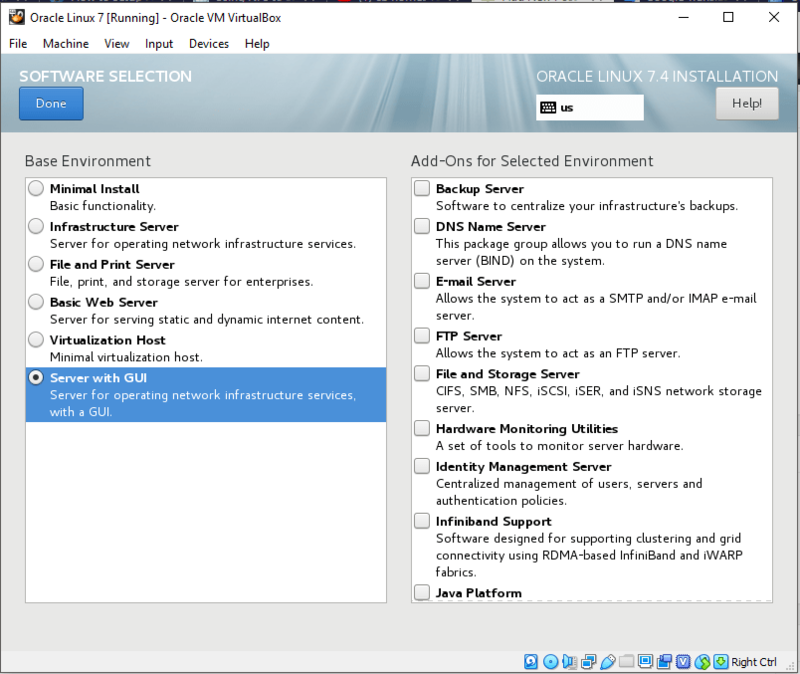 Select “Server With GUI” under Base Environment. 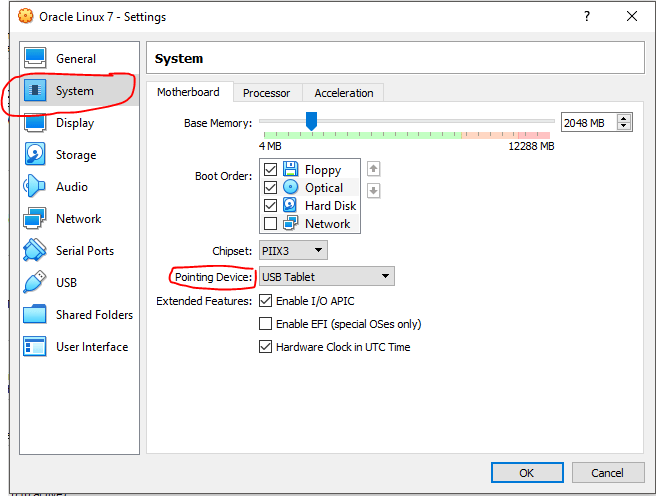 Configure INSTALLATION DESTINATION under SYSTEM. 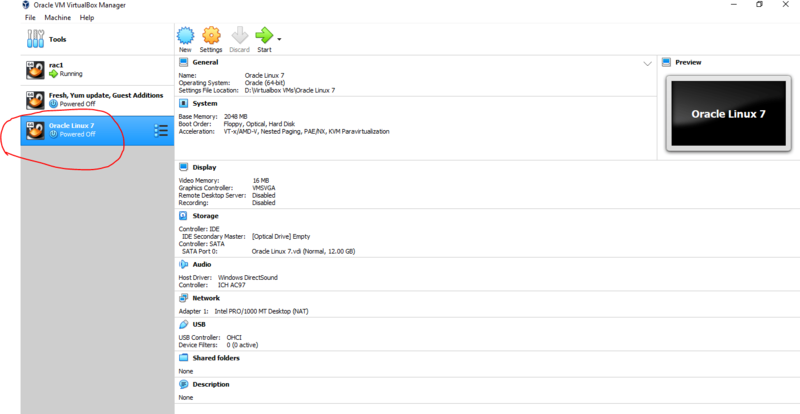 Select the device under the Device Selection. 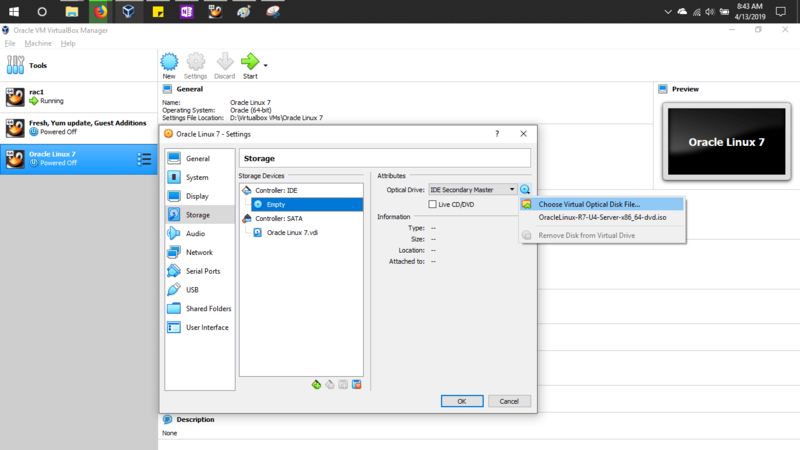 Select “Automatically configure partitioning” under the Other Storage Options. 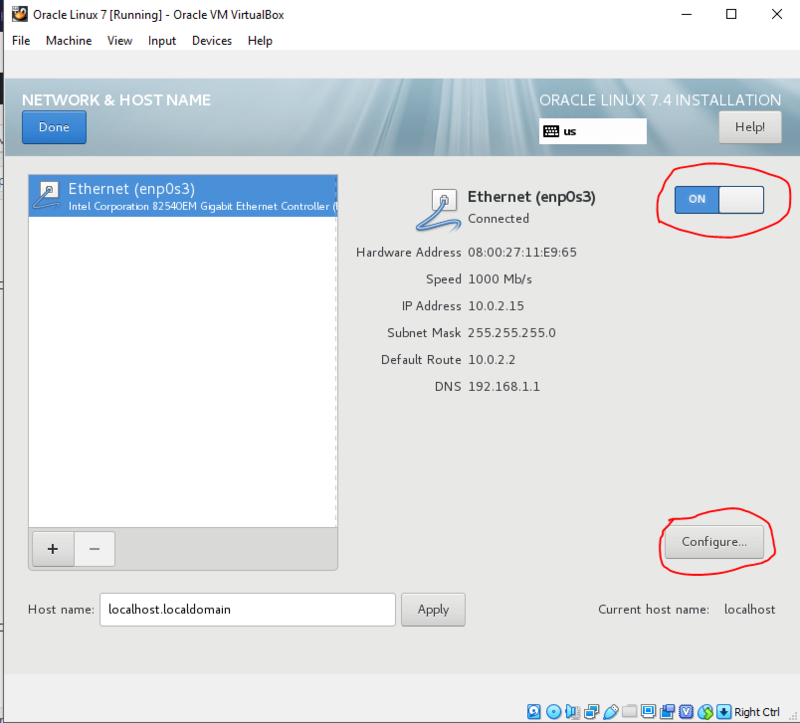 Configure NETWORK & HOSTNAME under SYSTEM. 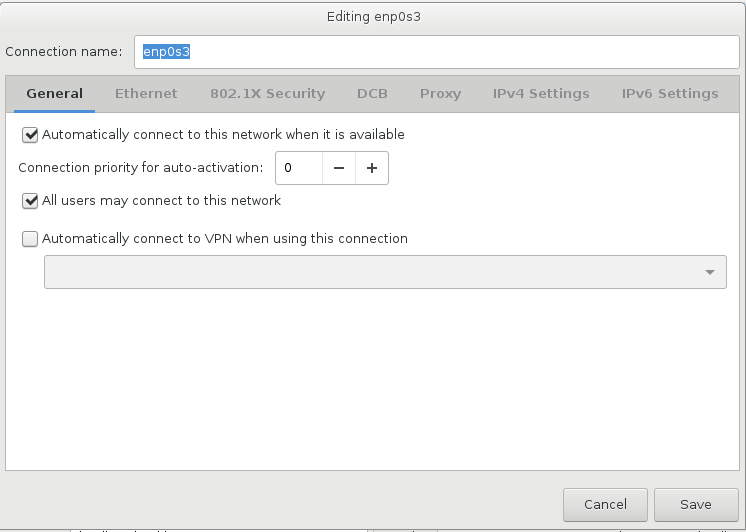 Toggle the Ethernet(enp0s3) to ON. 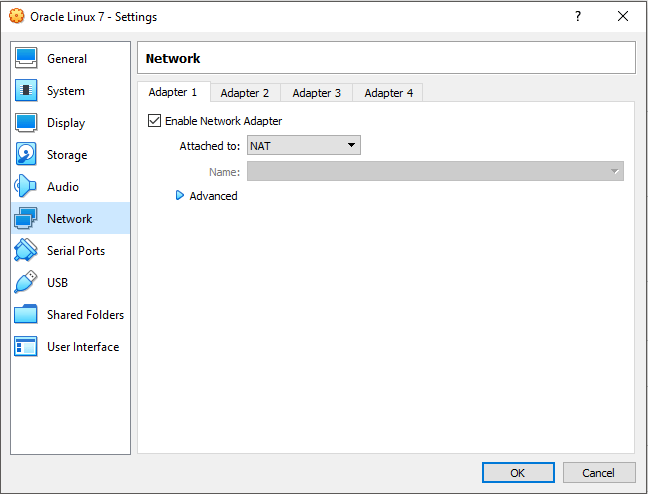 Select “Automatically connect to this network when it is available”. Installation will continue installing packages. Upon reboot accept the license. 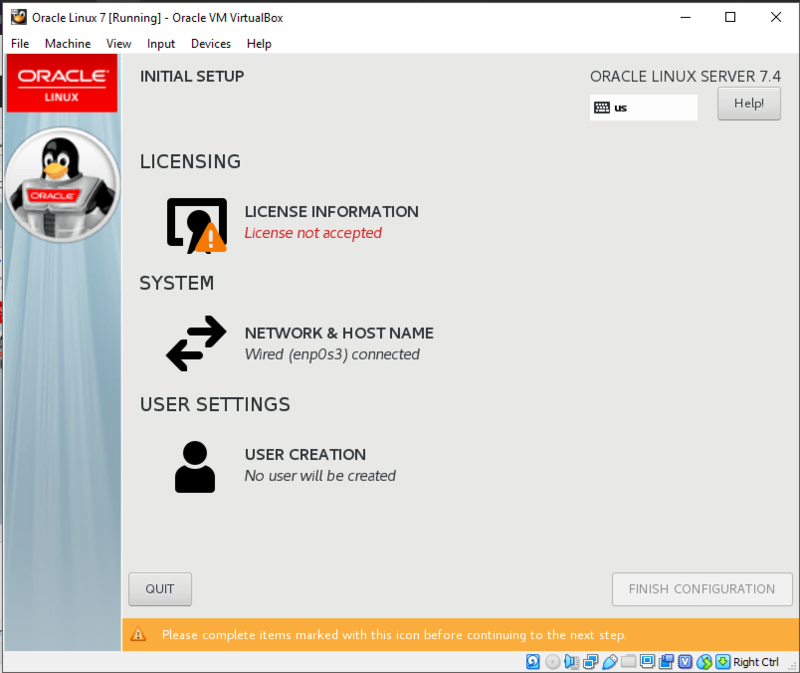 Select the LICENSING INFORMATION under LICENSING. 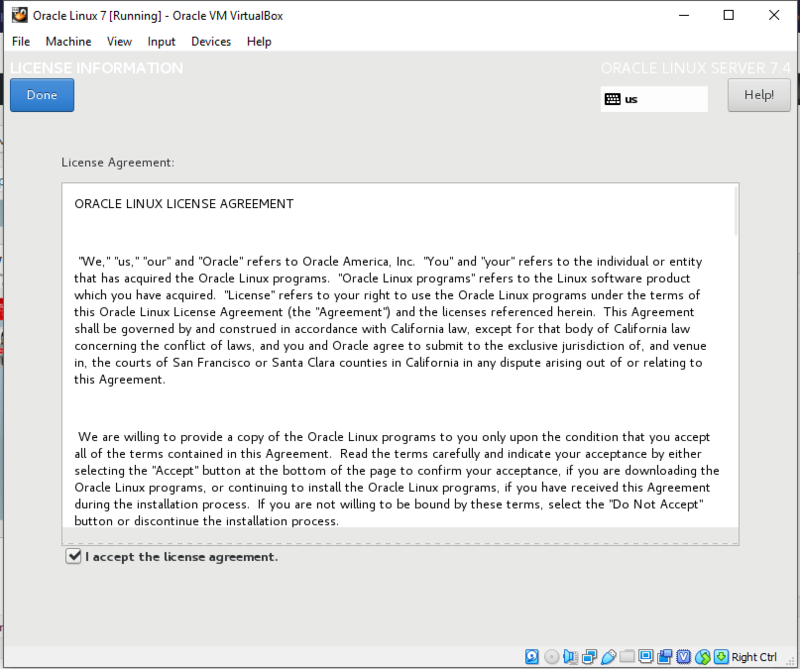 Select “I accept the license agreement”. 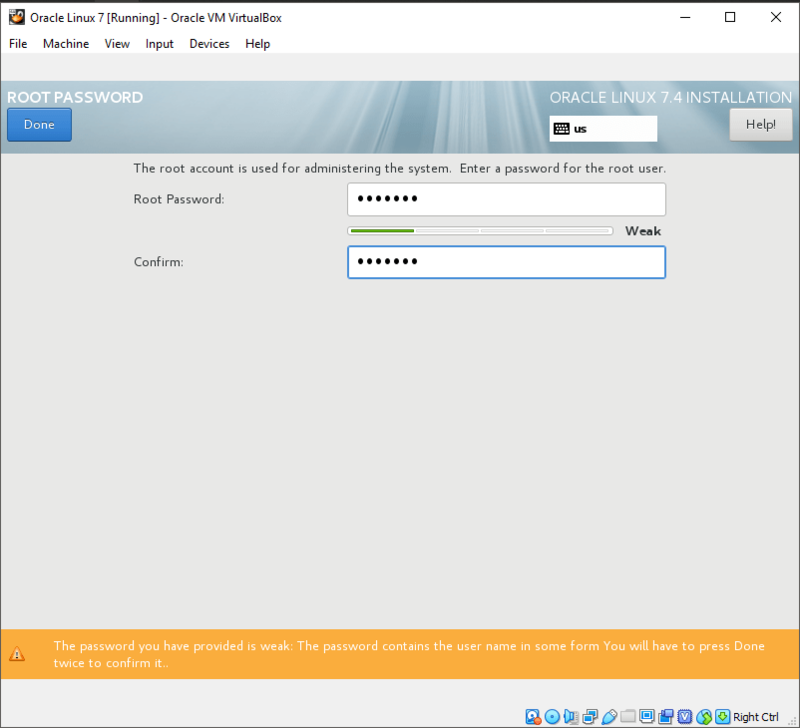 Supply the “Full Name”, “User Name”, and set a “Password”. 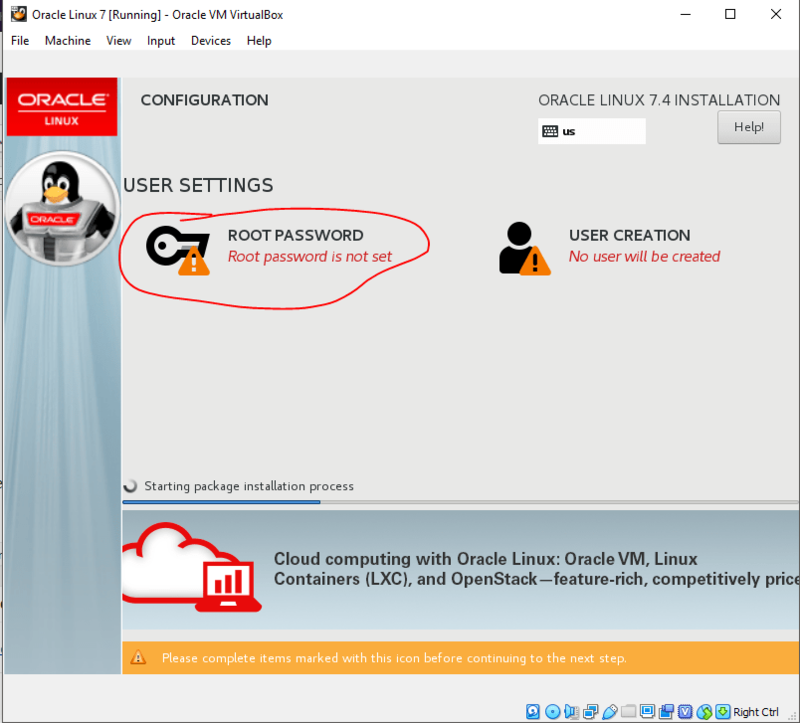 Login windows will appear, login to the user created. 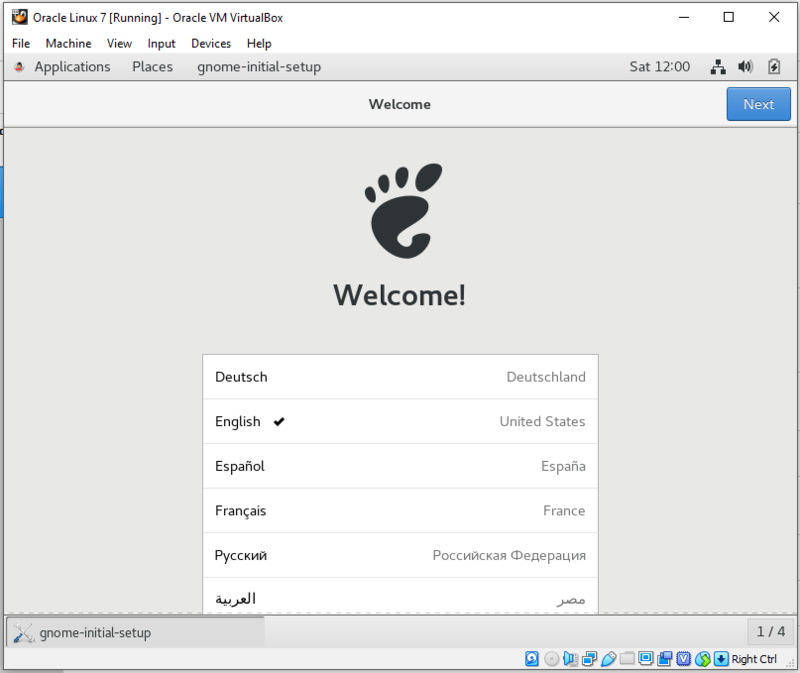 Continue with the GNOME initial setup and you are ready to go. 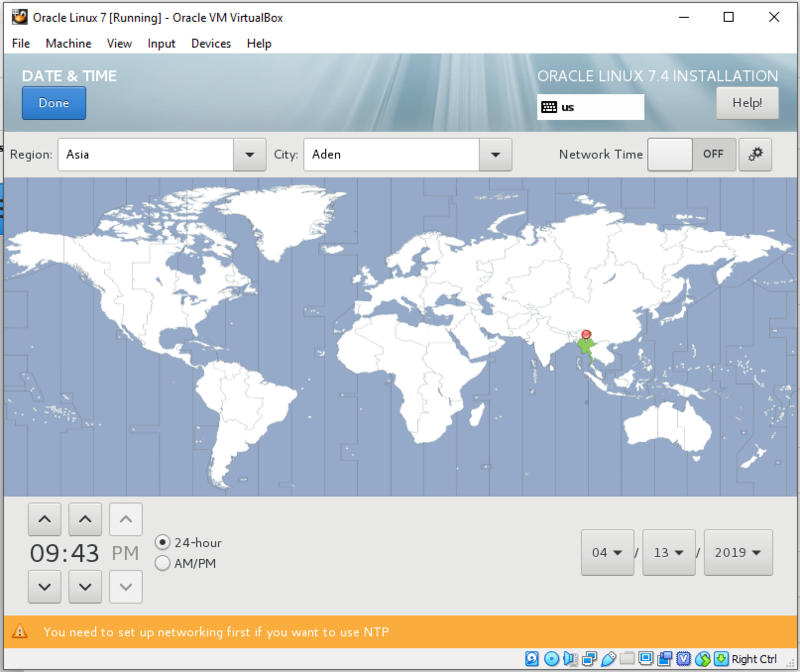 The installation of Oracle Linux 7 is done.